This blog post could also be titled, "The Only New Year's Resolution That I've Ever Successfully Kept." Hopefully either the actual title or the secondary title caught your eye, and you're interested in hearing me talk about something a little different than my usual blog content today. Going into 2017, I'm hoping to share more regular and different type lifestyle posts here on the blog, and I thought I would kick things off with this post. To start, I've always been very money conscious. My parents had me open my first savings account at our local bank when I was just five years old. As a little girl, whenever I received money as a gift for holidays or other occasions, I would always prioritize putting it into my bank account before spending it. Once I got into college and had both a checking and savings account, and lots more regular expenses, it started becoming harder to deposit into savings instead of my checking account. By the start of my senior year of college, I had saved up several hundred in my savings account. However, I went on a few different weekend trips during Fall 2015, and with travel expenses for each trip I would always reach to my savings account, and it was quickly drained. I've heard a lot in the past few years about financial guru Dave Ramsey, and his Financial Peace University program. Once I have a full-time job later in 2017, I would love to take a finance class based on his principles. It's never too early in your career for smart financial habits! But anyways- one Dave Ramsey tip which I have heard a lot of people talk about is that it's essential to always have $1000 in savings. (It's actually apart of the 7 Baby Steps which are listed right on Dave Ramsey's website!) I decided that I was going to make putting $1000 into my savings account my New Year's resolution for 2016. This money was not going to be touched, unless I had any sort of emergency come up. This meant no using the money for shopping, travel, or everyday expenses, like I did with my savings in past years. I also want to clarify that New Year's resolutions are something that I've never been good at. I make them each year, but have always struggled with keeping them. Usually they're a very general goal, something along the lines of "I'm going to go to the gym more this year" or "I'm going to eat more fruits and vegetables this year". But I'd never set such a specific resolution for myself before, and I was excited for the challenge. I knew that I needed a savings plan to follow, and it only took a little bit of searching for me to find exactly what I needed - the 52-Week Savings plan. It was the best thing for me to find. 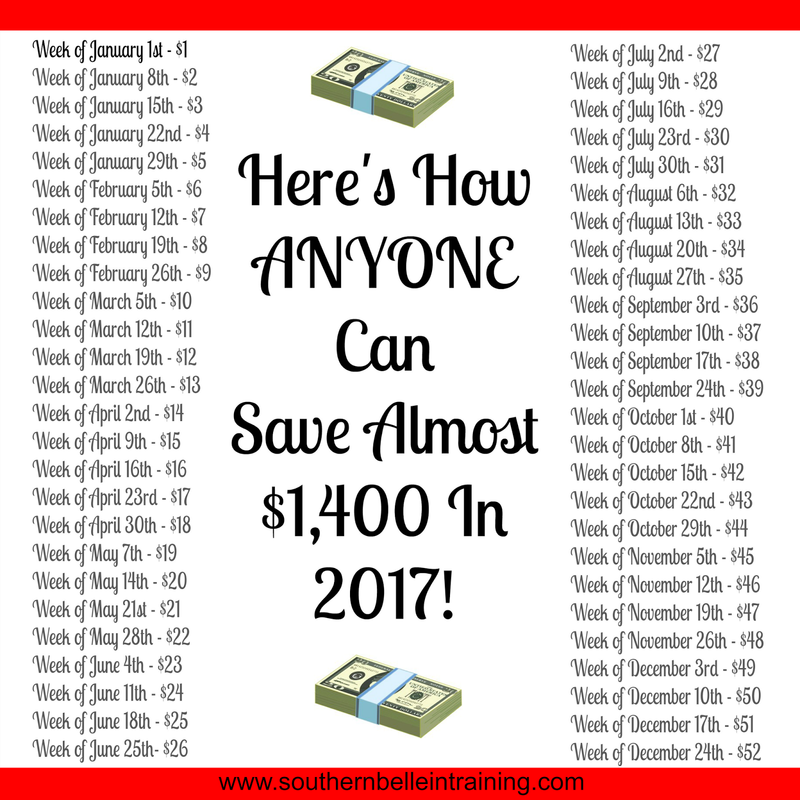 This is truly the easiest savings plan to follow, and if you do it diligently, you will end up with $1,378 at the end of the year. Here is how it works: for each week of the year, you put that dollar amount in your savings account. The first week of the year you put only $1 into savings... and then by the last week of the year in December, you deposit $52 in your savings account. The easiest way for me to keep track of it was to write out each dollar amount due for each week in my agenda, and then to check it off after I made each week's deposit. Next week I will make my last deposit into my savings account, and I'm so enthusiastic to say that I saved over $1000 this year! I don't quite have the full $1,378, as I had some unexpected costly car repairs come up in September, and I pulled some money from this account to help pay for them (I qualified this as an emergency expense). But I did hit over $1,000, and for that I am proud of myself! I was a full-time college student for half of 2016, and have been a part-time student in broadcasting school for the other half. As far as income: I've worked part time this year as both a babysitter and had a retail job, have had a paid internship, and also make money through my blog, but all of that combined still doesn't add up to a full-time job income yet. Despite being on a tighter student budget, I was still able to complete this savings plan. If I can do it, anyone can! I've made a graphic with the 2017 calendar weeks matched to the dollar amounts for this savings plan, if you're interested in making it your resolution for the next year and giving it a go. I know that I would highly recommend it- it's easier than you think, and you will feel so accomplished once it's done! And if you do have an emergency come up during the year, you'll feel great knowing that you have money on hand for that purpose. Have you ever completed a savings plan or had financial goals as apart of your New Years resolutions? Congrats Annaliese!!!! Having an emergency fund is so important!! Lord. I need to do this next year. You're the bomb. This is super inspiring, I am so bad about saving but this past year I really cracked down on myself when it comes to finances. I just might adopt this same savings plan for 2017! I love this idea! I want to do this in 2017! Oooh I might have to do this! what a great accomplishment! I am super frugal too so I feel ya on the importance of saving money. This is so awesome! Totally something I would love to do! Congrats and keeping up this resolution! Wow this is an awesome goal and congrats on completing it! I love this whole savings guide I will have to try it for the upcoming year! Congrats! that's so awesome! I've read Dave's book "financial freedom" I think was the title? I used to teach it at local community workshops and it's got some seriously good stuff! I am currently doing a wealth coaching program with Invibed where I get daily text message videos to help me get a better grasp on some of the foundational topics (savings, loans, investing, mortgages, etc) and am working with a coaching who is a CFP on getting my financial plan! It's been a really cool experience! I think getting this all together younger is always better! Congrats on completing your goal, that's really amazing as a college student! I'm in school as well and I know a lot of people our age spend all the money they make and don't put money into savings! congrats babe!!! thats so awesome. its so hard to save money when in school. This is genius! Congrats - so awesome!! I need to try this out in 2017! Oh my gosh, I totally need to try this out this year- it sounds awesome!